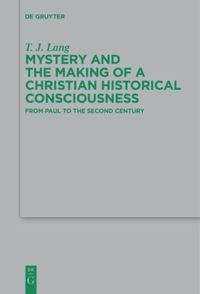 2017.01.01 | T. J. Lang, Mystery and the Making of a Christian Historical Consciousness: From Paul to the Second Century. BZNW 219. Berlin: De Gruyter, 2015. pp. xii +293. ISBN: 9783110442670. Early Christian conceptions of history are a complicated matter to study. Many early Christian texts highlight continuity between God’s actions in and after Jesus and the way in which God acted prior to Jesus. However, other passages suggest a break, even a rupture, which occurred after Jesus. 2016.07.13 | Jennifer R. Strawbridge. The Pauline Effect: The Use of the Pauline Epistles by Early Christian Writers. SBR 5. Berlin: Walter de Gruyter, 2015. pp. vii + 309. ISBN: 978-3-11-043770-6. Many thanks to Walter de Gruyter for providing a review copy. 2016.04.05 | Michael Cover. Lifting the Veil: 2 Corinthians 3:7-18 in Light of Jewish Homiletic and Commentary Traditions. BNZW 210. Berlin: Walter de Gruyter, 2015.
Review by Benjamin Winter, St Louis University.